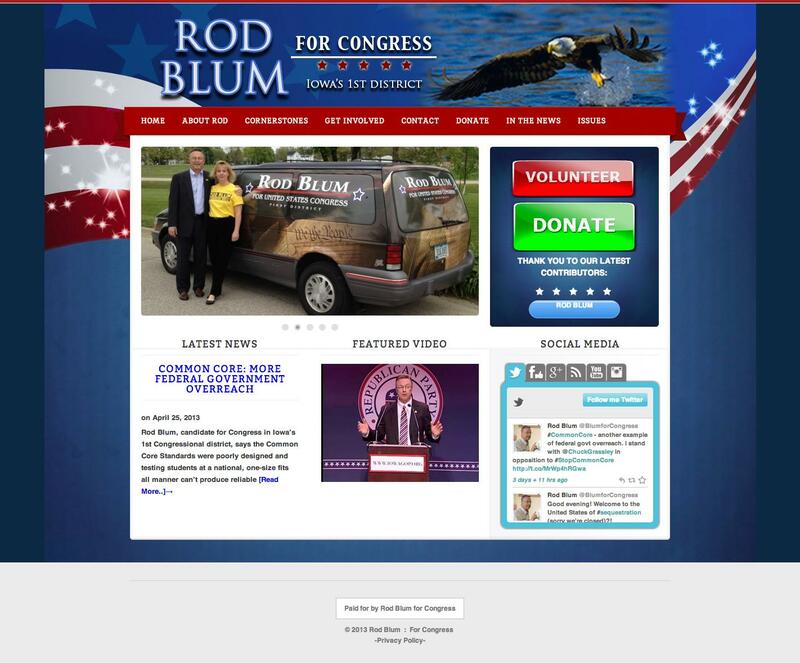 Every day this week I’ll post my critique of the websites of candidates for office here in Iowa. I’ll be looking at form as well as functionality. Specifically, does it look good on all devices, both desktop and mobile? The Washington Post reported earlier this year on the explosion of mobile internet users. Let’s get started with District 1. We have three declared candidates and one candidate with an exploratory committee. Potential candidates aren’t being graded. Have I missed one? Let me know. Detail level Single splash page. Fine for this early in the race. Nice big social following buttons up top, clean typography. Fully responsive. Good calls to action that are eye catching while matching the color scheme. That said, I don’t like color scheme and found some inconsistency in how buttons are displayed, especially on the mobile site. 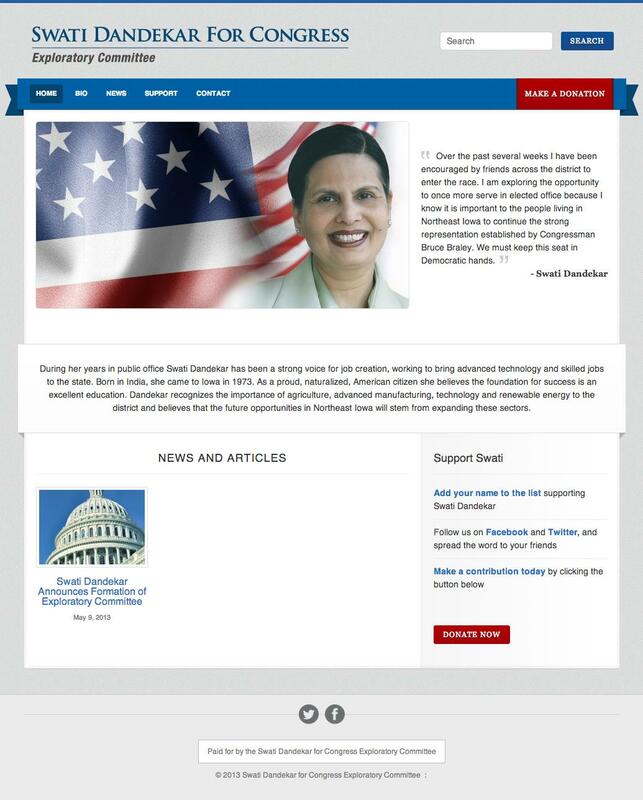 CMS WordPress, “Campaign” theme. A good choice. 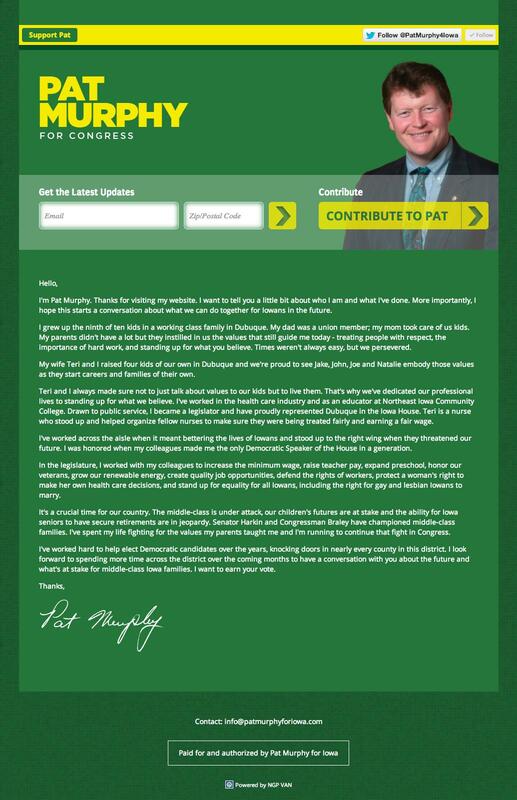 Worst campaign URL EVER. Good first blog post that contains resources for others to use. Give us more! “About the author” section needs to be fleshed out. There’s a person writing these posts (I hope?) and I doubt their name is “Admin.” Comments on a blog need to be either open or nonexistent (they should be open.) Never closed. NO EMAIL CAPTURE?. I have to click through to “Support.” I don’t necessarily support her. Maybe I’m shopping around. Get rid of “search” form in top right until there’s more content to search for. Call to action Big janky looking buttons. No email capture. Good social widget in bottom right. Big buttons have jagged edges, eagle is blurry, also his stance on women’s rights, accessibility of health care, stand your ground and “our nations ability to to produce domestic sources of energy.” But that’s besides the point. CMS None, by the looks of the source code. Call to action Very clear email capture area, volunteer and contribute buttons below. 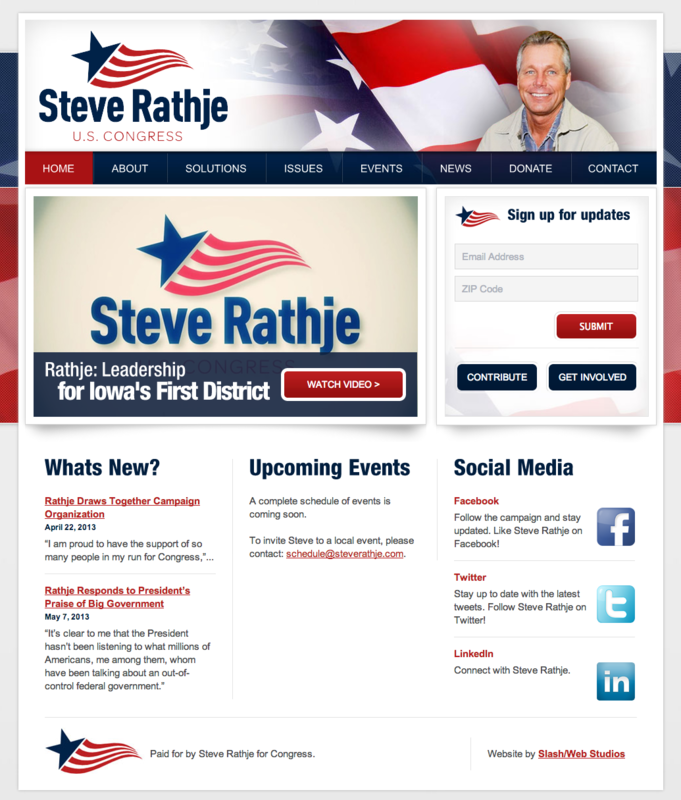 Mr. Rathje has very fleshed out issues and solutions sections as you’d hope from a guy running for office this long. Clean typography. Posts on News page are out of order, which make me think there’s no content management system like WordPress or Drupal. Not that that’s a necessarily bad thing but a bit odd nowadays. That’s it for District 1! Should I be looking at other criteria? Am I missing a candidate or two? Do you agree or disagree with my ratings? Leave a comment below or send me an email. I’d love to hear your thoughts.